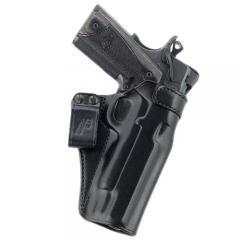 The Galco N3 holster is a lightweight inside-the-waistband design, built for low-profile concealability and a quick draw. It is made from durable saddle leather, allowing it to mold to the body over time for a comfortable fit. Its raised sweat guard protects the firearm from your sweat, and also provides a layer of padding between it and your body for protection. The opening is reinforced for increased rigidity, making it easier to return your weapon after use, and the open top makes it easy to draw quickly. Its offset belt loop provides a close and stable fit, and fits belts up to 1.5 inches wide. I love this in the belt holster. It is very comfortable no issues.